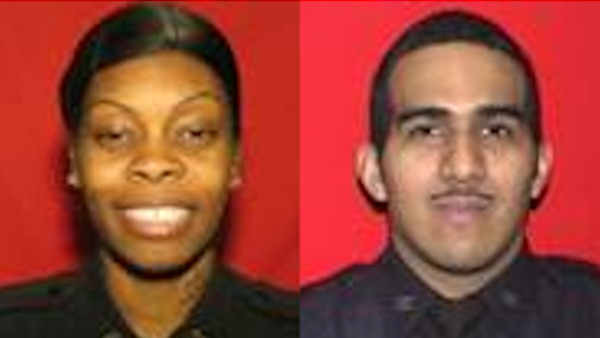 NEW YORK (WABC) -- Two Rikers Island correction officers have been indicted on charges of working together with four inmates to attack a fellow inmate. 39-year old Nakia Gales and 41-year old Herman Jiminian are charged with falsifying business records, offering a false instrument for filing and official misconduct. Bronx District Attorney Robert Johnson said the charges stem from a January 29, 2014 incident inside Rikers Island's Vernon C. Bain Center. "It's alleged that, following a previous trash-talking altercation, Gales, with Jiminian's help, recruited the four charged inmates from an adjoining housing area to assault Gilbert Bacallao, in order to teach him a lesson," said Johnson. Gales is accused of luring Bacallao into the vestibule with the promise of a package arrival. Once in the vestibule, the inmates surrounded and assaulted the victim, according to the indictment. Johnson said Gales is also allegedly affiliated with a gang, as evidenced by the tattoos on her neck, marks which are broadly recognized to signify gang membership. The officers are also accused of concealing the circumstances of the assault by recording false narratives in their "use of force" paperwork. If convicted, the two face up to seven years each behind bars.